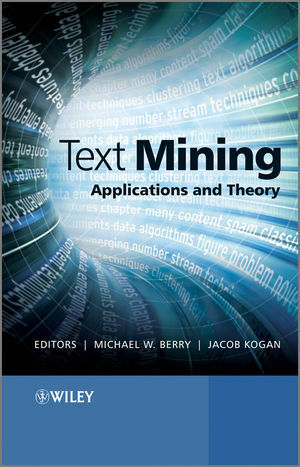 Text Mining: Applications and Theory presents the state-of-the-art algorithms for text mining from both the academic and industrial perspectives. The contributors span several countries and scientific domains: universities, industrial corporations, and government laboratories, and demonstrate the use of techniques from machine learning, knowledge discovery, natural language processing and information retrieval to design computational models for automated text analysis and mining. Provides state-of-the-art algorithms and techniques for critical tasks in text mining applications, such as clustering, classification, anomaly and trend detection, and stream analysis. Presents a survey of text visualization techniques and looks at the multilingual text classification problem. Discusses the issue of cybercrime associated with chatrooms. Features advances in visual analytics and machine learning along with illustrative examples. Is accompanied by a supporting website featuring datasets. Applied mathematicians, statisticians, practitioners and students in computer science, bioinformatics and engineering will find this book extremely useful. Michael W. Berry, Professor and Associate Department Head, Department of Electrical Engineering and Computer Science, University of Tennessee. Michael is on the Editorial board of Computing in Science and Engineering and Statistical Analysis and Data Mining Journals. Jacob Kogan, Department of Mathematics and Statistics, University of Maryland Baltimore County, USA. PART I TEXT EXTRACTION, CLASSIFICATION, AND CLUSTERING. 1 Automatic keyword extraction from individual documents. 1.2 Rapid automatic keyword extraction. 1.5 Evaluation on news articles. 2 Algebraic techniques for multilingual document clustering. 2.7 LSA with term alignments. 2.8 Latent morpho-semantic analysis (LMSA). 2.9 LMSA with term alignments. 2.10 Discussion of results and techniques. 3 Content-based spam email classification using machine-learning algorithms. 3.4 Evaluation of email classification. 4 Utilizing nonnegative matrix factorization for email classification problems. 4.3 NMF initialization based on feature ranking. 5 Constrained clustering with k-means type algorithms. 5.2 Notations and classical k-means. 5.3 Constrained k-means with Bregman divergences. 5.4 Constrained smoka type clustering. PART II ANOMALY AND TREND DETECTION. 6 Survey of text visualization techniques. 6.1 Visualization in text analysis. 6.3 Authorship and change tracking. 6.4 Data exploration and the search for novel patterns. 6.6 Visual analytics and FutureLens. 6.10 Scenario discovery example: bioterrorism. 6.11 Scenario discovery example: drug trafficking. 7 Adaptive threshold setting for novelty mining. 7.2 Adaptive threshold setting in novelty mining. 8 Text mining and cybercrime. 8.2 Current research in Internet predation and cyberbullying. 8.3 Commercial software for monitoring chat. 9 Events and trends in text streams. 9.3 Feature extraction and data reduction. 9.6 Event and trend descriptions. 10 Embedding semantics in LDA topic models. 10.4 Embedding external semantics from Wikipedia. 10.7 Conclusion and future work.